Zion Health Launches Natural Deodorant Formulated With Detox Clay to A Matter of Health in New York City. New York City health food store, A Matter of Health offers unique natural deodorant- Clay Dry Non-Aluminum deodorant formulated for athletes. Following numerous successful product debuts throughout the United States, California-based Zion Health has announced the arrival of ClayDry, an all-natural deodorant, to A Matter of Health. This popular health food store is located in New York City at 1478 First Avenue. ClayDry Natural Deodorant is formulated with a high grade of Bentonite Detox Clay; Calcium Montmorillonite. This unique clay contains more than 57 trace minerals well known for its natural detoxifying abilities. ClayDry is now available at A Matter of Health and online at http://www.adamaminerals.com. Instead of aluminum compounds, ClayDry's base is formulated from calcium montmorillonite clay— a nutrient-rich clay that is well known for its absorbent properties. In addition to ClayDry’s unscented model, formulae that have been scented with citrus blossom and lavender are also available. A Matter of Health is a high-quality health food store that is committed to providing “the finest quality fresh, natural, organic and whole foods” to their customers and serves as the go-to store for a healthy lifestyle. A Matter of Health sells essential lines of organic groceries, vitamins and natural body care products. The most recent addition includes Zion Health’s ClayDry Non-Aluminum Deodorant. Based in San Francisco, California, Zion Health offers a wide range of Natural clay-based body care products. 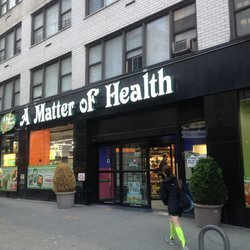 Zion's Healing Clay line is now available at Matter of Health in New York City located at 1478 First Avenue and at local markets nationwide including Whole Foods Markets, Lassen’s Markets, Chamberlain Health Foods, Rainbow Grocery Stores, and Health Co-ops throughout the U.S, and Canada. Zion Health provides consumers with pure skin and body care products that are 100% vegan, free of parabens and aluminum, and are formulated using certified organic ingredients whenever possible. For more information visit their website.